Sam Bridge | Planting & After Care Instructions | Nursery & Greenhouses LLC. Planting is a fun and rewarding experience. Follow these guidelines to set you on the right path towards successful gardening. It’s easier than you think. If you have any questions at all, the experts at Sam Bridge Nursery & Greenhouses are here to help. First and foremost, locate any underground utilities. Not sure? Call before you dig. Dial 811. Clear the area of all debris and unwanted plants. Be sure to pick up plants by the ball or pot to reduce unnecessary breakage. Dig a hole the same depth as the pot or ball. The width should be at least 12” wider (or about the size of your shovel head). Tamp the bottom of the hole prior to placing the plant to prevent settling. If your plant is in a pot, squeeze the pot on each side to loosen the root ball from the inside of the container. Tilt it on an angle, holding the top of the plant away from you, pointed towards the ground and slide the pot off the bottom of the plant. 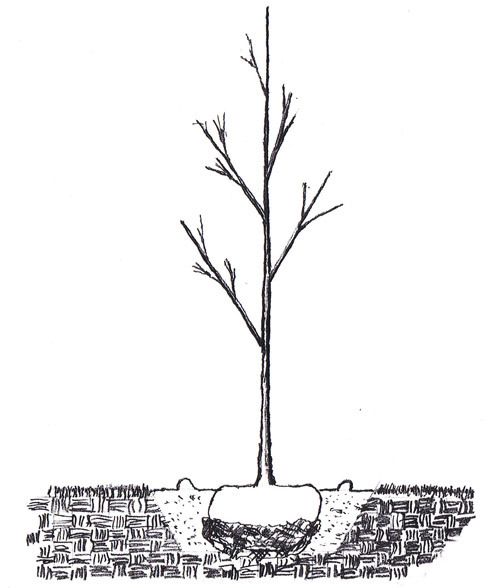 Be sure to hold the plant at the base to support both the root ball and the top of the plant as you remove the container. If the plant is too big to do so, cut away the pot with a knife or strong scissor. Tease the roots along the bottom, you can use fingers or a knife depending on the size of the roots. It is imperative to keep the root ball of the plant intact. If your plant is balled and burlaped, place the ball in the hole. Then remove the top half of the wire basket (and/or string) and pull the burlap back. You can fold it down or cut it away. Be sure to keep the burlap away from the surface. If any of it is exposed, it acts as a wicking agent allowing moisture to escape and the roots to dry out. Mix compost and Biotone in with your backfill as you fill in your hole. This will ensure your plants are getting the proper nutrients and the best tools to survive. Starter/general purpose fertilizer can also be added now. After you’ve filled in your hole and tamped down the soil/compost mix to remove all air pockets, build a water dam. Make a berm that goes around the base of the plant along the drip-line (the outermost edges of the branches). This will help water stay in place, soaking into the roots. Apply a layer, 2-4” thick, of mulch to the top of the soil in your garden bed or around of your plants, be sure to leave a mulch-free ring of at least 4-6” around the base of your. ‘Volcano mulching’ (mulch piled on the trunk) attracts insects and disease. Give your plants some room to breathe! Watering & Aftercare: Watering is the number one reason people don’t succeed in their gardens. It is imperative to water on a regular basis for your plants to thrive. But, not all plants need the same amount of water. Trees & Shrubs: Newly planted trees and shrubs need to be watered thoroughly 1-3 times per week (depending on wind and temperature, more for hot, less for cool) for their first year and again for at least the second summer. Thoroughly means putting your hose on a slow trickle for 20 minutes at the base of the plant. Sprinkler systems that go on for 15 minutes a day are not enough for newly planted trees and shrubs. Switch to drip irrigation or soaker hoses for 30+ minutes at a time depending on the size of your plants. Broadleaf evergreen trees and shrubs need to be treated with an anti-dessicant right around Thanksgiving to prevent winter burn. This can be re-applied during February on a day where the temperature is above 40°. Perennials: Newly planted perennials need to be watered thoroughly every 2-3 days. After several weeks this can be cut back to one good soaking at least once a week. If it’s hot and or windy, you will need to check more than once a week as your plants could dry out more quickly. Apply a general purpose fertilizer at the time of planting. Planttone, Gardentone, Osmocote or 5-10-5 are all great products. Annuals: Most annuals tend to dry out quickly. Be sure to check them daily especially during the summer months. As long as you are watering thoroughly, until water runs from underneath the pot, you should be able to get away with watering 2-3 times per week. The smaller the container, the more often you will need to water (this is especially true with hanging baskets). Use Miracle Gro once a week or Osmocote once every 2-3 months. For an organic option try Nature’s Source once a week. Houseplants: Most houseplants need a good soaking once a week. If your plant is dropped into another container, water it in the sink and let it drain before putting it back. Most houseplants do not like to sit in water. Be sure you have adequate drainage. If you place your plant near a heating or air conditioning vent, it will dry out more quickly, so please be aware. Fertilize once a month. Lawns: Sodding and Seeding: Newly installed Sod requires watering once daily for at least one week after installation. It will then need to be watered 2-3 times per week after that until it starts to root. Newly seeded lawns need light watering 2-3 times per day until the seed germinates. After the seed has started to grow a good soaking once a week should be fine. In the heat of the summer this may have to be 2-3 times per week. Early morning is the ideal time to water.